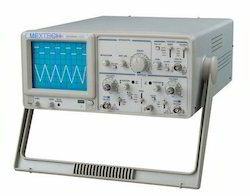 We are offering a wide range of Analog Oscilloscopes OS5020. It is analog devices which is use of continually varying voltages, digital devices employ binary numbers which correspond to samples of the voltage. In the case of digital oscilloscopes, an analog-to-digital converter (ADC) is used to change the measured voltages into digital information. Waveforms are taken as a series of samples. The samples are stored, accumulating until enough are taken in order to describe the waveform, which are then reassembled for display.